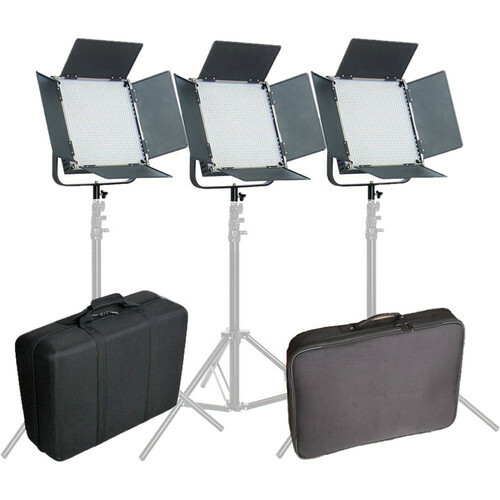 The High CRI 1024 Bi-Color LED 3-Light Kit from Came-TV is a great core lighting kit both in the studio and on the road. The kit includes 3 1024 LED Bi-Color dimmable lights with 4-way barndoors, multi-voltage AC adapters, V-Mount battery plates, yokes with 5/8" stand mounts and removable diffusion filters. Two carry cases complete the kit. Featuring an array of 1024 LEDs, this high CRI panel provides a bright, soft light well-suited to video production while drawing very little power and running barely warm to the touch. This model offers a high CRI for faithful and accurate color rendition along with variable color temperature from 3200 - 5600K or anywhere in between. Instead of downtime incurred by having to tape on filters you can match other fixtures' output or the ambient light conditions with the simple twist of a knob. Flexibility, key to the design of the LED 1024 also extends to light output which is dimmable without flicker from 10 - 100% and displayed on the back panel LCD screen. Built-in 4-way barndoors allow you to put the light where you want it and keep it from areas that you don't. The 1024 LED Bi-Color comes with a yoke with 5/8" receiver for mounting on a light stand. Power input is handled via 4-pin XLR connection and the included 100-240 VAC adapter or an optional V-Mount battery plate and battery. Box Dimensions (LxWxH) 23.5 x 19.8 x 15.2"
High CRI Digital 1024 Bi-Color LED 3-Light Kit is rated 3.0 out of 5 by 1. Rated 3 out of 5 by Beadle Biker from Separate Shipping Problematic This is the second time I am trying to order light sets from you. I understand you are the middle man and your vendors drop ship from their own locations. In the first attempt to get lighting the vendor sent us items that were obviously used or returned merchandise and you processed the return and got it credited back to us fairly easily. However, it took several shipments before we had everything to check it out. This order again has arrived with the lights and we are waiting on stands now. It is difficult to assess when it comes in bits and pieces over 3 weeks so far, 4 if it doesn't come this week. That is after 2-3 weeks of waiting for it to process and ship. All that being said, I think we are looking at a quality product once everything is here. Does this kit come with a remote to adjust the dimmer and temperate like the ikan equivalent? No it does not come with a remote or an external battery. It i nly comes with the light and the power supply. Does this item come with the stands?